Announcing SLOB 2.4! 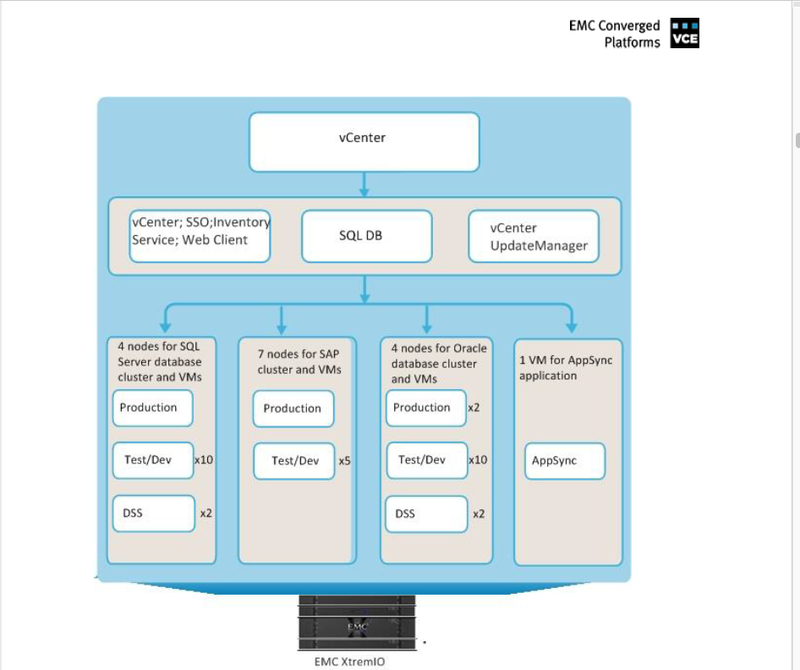 Integrated Short Scans and Cloud (DBaaS) Support, and More. This post is to announce the release of SLOB 2.4! SLOB 2.4.0. Release notes (PDF): Click Here. As always, please visit the SLOB Resources page. Click Here. Short Table Scans. This release introduces the ability to direct SLOB sessions to perform a percentage of all SELECT statements as full table scans against a small, non-indexed table. However, the size of the “scan table” is configurable. Statspack Support. This version, by default, generates STATSPACK reports instead of Automatic Workload Repository (AWR) reports. This means that SLOB testing can be conducted against Oracle Database editions that do not support AWR–as well as the ability to test Enterprise Edition with fewer software licensing concerns. AWR reports can be generated after a simple modification to the slob.conf file. External Script Execution. House-keeping of run results files and the ability to, for example, issue a remote command to a storage array to commence data collection is introduced by the EXTERNAL_SCRIPT feature in SLOB 2.4. SLOB 2.4 has been tested on public cloud configurations to include Amazon Web Services RDS for Oracle. SLOB 2.4 changes to slob.conf parameters, and other infrastructure, makes SLOB 2.4 the cloud predictability and repeatability testing tool of choice as of SLOB 2.4. Please see the SLOB 2.4 Documentation in the SLOB/doc directory. Or, click here. Chris Osborne (@westendwookie). Chris provided a functional prototype of the new SLOB 2.4 Scan Table Feature. Thanks, Chris! Christian Antognini (@ChrisAntognini): Chris provided a functional prototype of the new SLOB 2.4 support for statspack! Thanks, Chris! James Morle (@JamesMorle). James has helped with several scalability improvements in slob.sql based on his astonishing high-end SLOB testing. With thousands of sessions attached to a dozen or more state-of-the-art Xeon hosts connected to NVM storage led to several issues with proper start/stop synchronization and thus impacting repeatability. James also created the new SLOB 2.4 EXTERNAL_SCRIPT feature. As always, thanks, James! Maciej Przepiorka (@mPrzepiorka): Maciej conducted very thorough Beta testing and enhanced the EXTERNAL_SCRIPT feature in SLOB 2.4. Thanks, Maciej. Martin Berger (@martinberx): Martin conducted significant Standard Edition testing and also enhanced the SLOB/misc/awr_info.sh (SLOB/misc/statspack_info.sh) script for producing performance data, in tuple form, from statspack. Thanks, Martin! Readers: I do intent to eventually get proper credentials to make some posts on that blog. All in proper time and with proper training and clearance. This is just a quick blog entry to showcase a few of the publications from IT vendors showcasing SLOB. SLOB allows performance engineers to speak in short sentences. As I’ve pointed out before, SLOB is not used to test how well Oracle handles transaction. If you are worried that Oracle cannot handle transactions then you have bigger problems than what can be tested with SLOB. SLOB is how you test whether–or how well–a platform can satisfy SQL-driven database physical I/O. SLOB testing is not at all like using a transactional test kit (e.g., TPC-C). Transactional test kits are, first and foremost, Oracle intrinsic code testing kits (the code of the server itself). 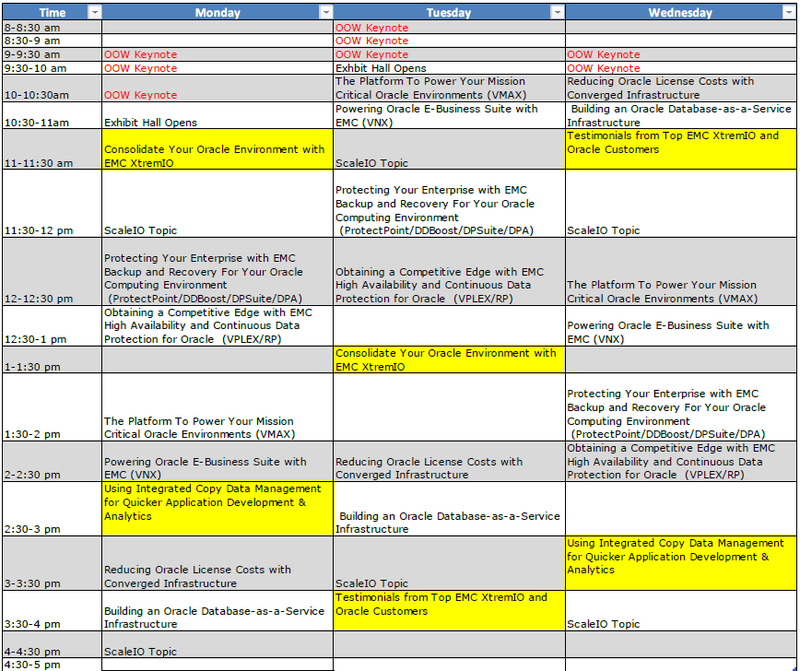 Here again I say if you are questioning (testing) Oracle code then something is really wrong. Sure, transactional kits can involve physical I/O but the ratio of CPU utilization to physical I/O is generally not conducive to testing even mid-range modern storage without massive compute capability. The following are links and screenshots from the likes of DellEMC, HPE, Nutanix, NetApp, Pure Storage, IBM and Nimble Storage showing some of their SLOB use cases. Generally speaking, if you are shopping for modern storage–optimized for Oracle Database–you should expect to see SLOB results. 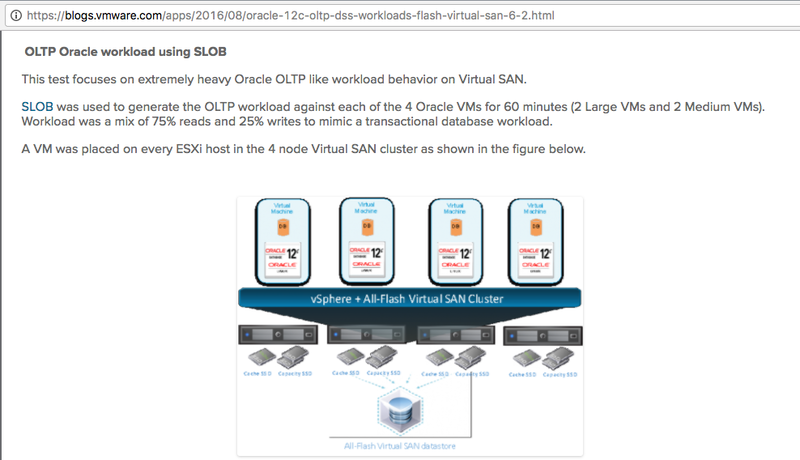 The first case is VMware showcasing VSAN with Oracle using SLOB at: https://blogs.vmware.com/apps/2016/08/oracle-12c-oltp-dss-workloads-flash-virtual-san-6-2.html. 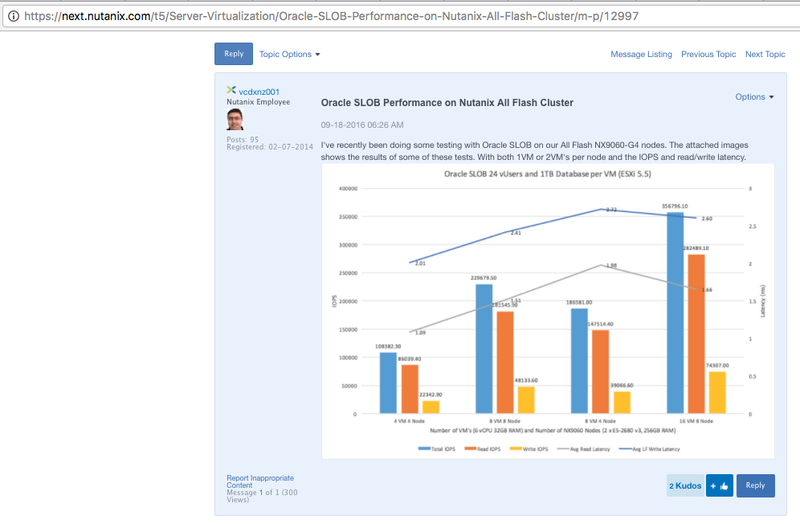 The next NetApp article entitled NetApp AFF8080 EX Performance and Server Consolidation with Oracle Database also features SLOB results and can be found here: https://www.netapp.com/us/media/tr-4415.pdf. There is an IBM 8-bar logo presentation showing SLOB results here: http://coug.ab.ca/wp-content/uploads/2014/02/Accelerating-Applications-with-IBM-FlashJAN14-v2.pdf. 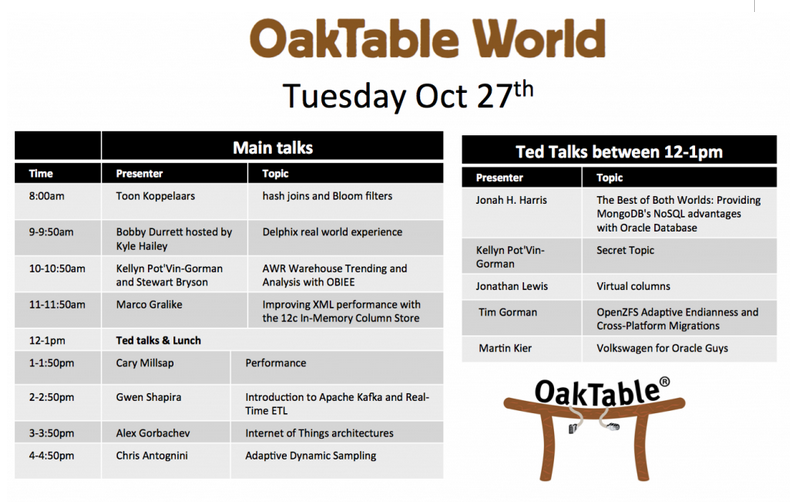 Yes, Storage Arrays Can Deduplicate Oracle Database. Here Is Exactly Why It Doesn’t Matter! I recently had some cycles on a freshly installed Dell EMC XtremIO Storage Array. I took this opportunity to prepare a blog entry about the never-ending topic of whether or not storage arrays are able to reduce physical data capacity through deduplication of blocks in Oracle Database. Before I continue, let me say something that may come as a surprise to you. 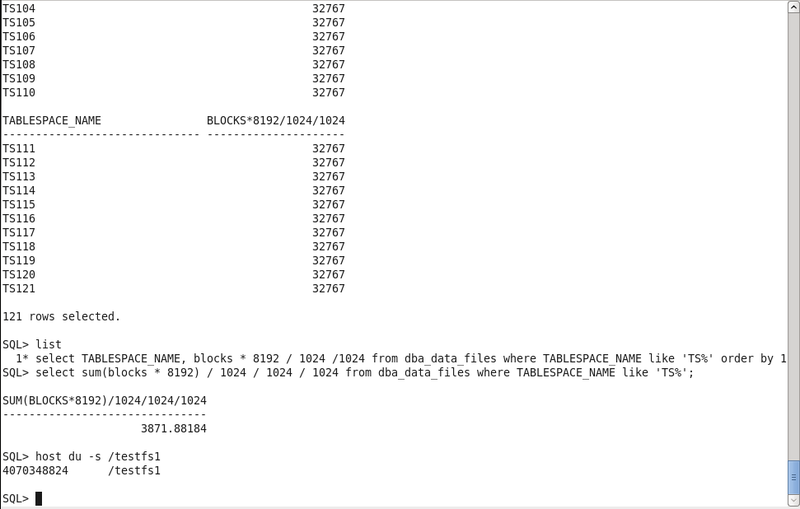 Yes, Oracle Database has duplicate blocks in tablespaces! Yes, modern storage arrays can achieve astonishing data reduction rates through deduplication–even when the only data in the array is Oracle Database (whether ASM or file systems)! XtremIO computes and displays global data reduction rate. This makes it a bit more difficult to show the effect of deduplication on Oracle Database because averages across diverse data makes pin-point focus impossible. However, as I was saying, I took some time on a freshly-installed XtremIO array and collected what I hope will be interesting information on the topic of deduplication. Please take a look at Figure 1. 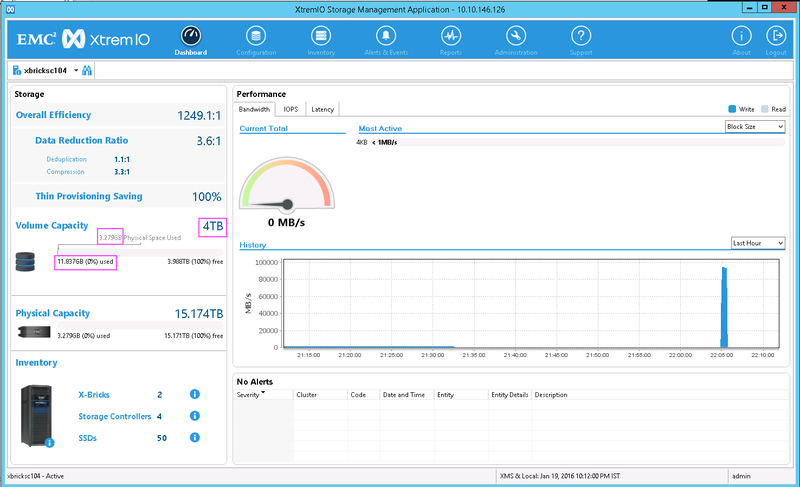 To start the testing I created a 4TB XtremIO volume, attached it as a LUN to a test host and then created an XFS file system on it. Please be aware that the contents of an Oracle datafile is precisely the same whether stored in ASM or in a file system file. After the file system was created I used the SLOB database creation kit (SLOB/misc/create_database_kit) to create a small database with Oracle Database 12c. As Figure 1 shows, the small database consumed 11.83GB of logical space in the 4TB volume. However, since the data enjoyed a slight deduplication ratio of 1.1:1 and a healthy compression ratio of 3.3:1 for a 3.6:1 data reduction ratio, only 3.27GB physical space was consumed in the array. The next step in the testing was to consume the majority of the 4TB file system with a BIGFILE tablespace. Figure 2 shows the DDL I used to create the tablespace. Figure 3 shows the file system file that corresponds to the tablespace created with DDL in Figure 2. 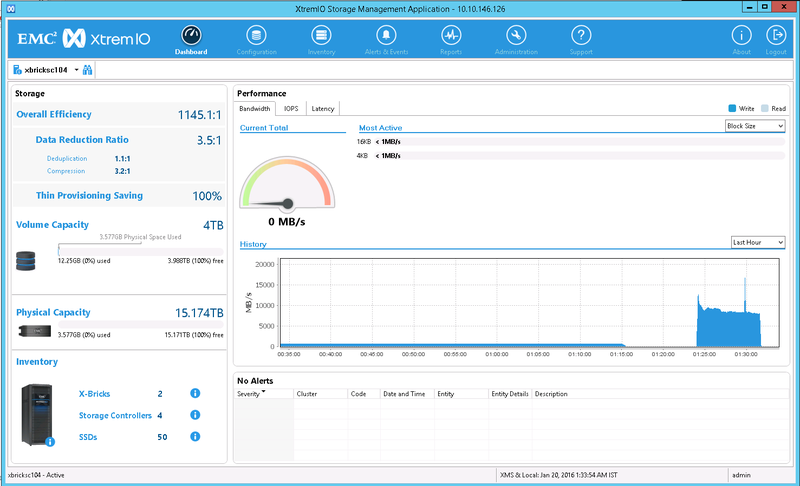 After creating the 3.9TB BIGFILE tablespace I took a screenshot of the XtremIO GUI Dashboard. As Figure 4 shows, there was no deduplication! Instead, the data was compressed 4.0:1 resulting in only 977.66GB physical space being consumed in the array. So why in the world would I blog the opposite of what I said above? Why show the array did not, in fact, deduplicate the 3.9TB datafile? The answer is in the fact that I said there are duplicate data block in tablespaces. I didn’t say there are duplicate blocks in the same datafile! To return the array to the state prior to the BIGFILE tablespace creation, I dropped the tablespace (including contents and datafiles thus unlinking the file) and then used the Linux fstrim(8) command to return the space to the array as shown in Figure 5. 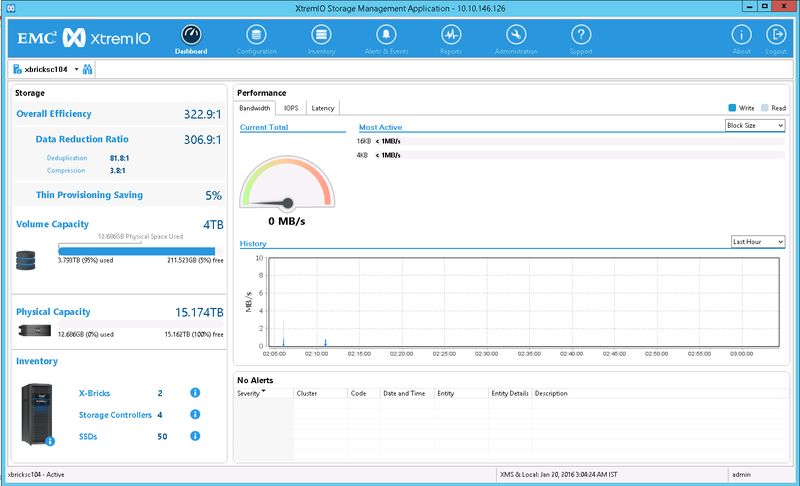 Once the fstrim command completed I took another screenshot of the XtremIO GUI Dashboard as shown in Figure 6. Figure 6 shows that the array space utilization and data reduction had returned to that of what was seen before the BIGFILE tablespace creation. The next step in the testing was to fill up the majority of the 4TB file system with SMALLFILE tablespaces. To do so I created 121 tablespaces each consisting of a single SMALLFILE datafile of 32GB. The output shown in Figure 7 is from a data dictionary query to display the size of each of the 121 datafiles and how the sum of these datafiles consumed 3.87TB of the 4TB file system. Once the file system was filled with SMALLFILE datafiles I took another screenshot of the XtremIO GUI Dashboard. Figure 8 shows that the SMALLFILE datafiles enjoyed a deduplication ratio 81.8:1 combined with a compression ratio of 3.8:1 resulting in a global data reduction rate of 306.9:1. Because of the significant data reduction rate only 12.68GB of physical space was consumed in the array in spite of the 3.79TB logical space (the sum of the SMALLFILE datafiles) being allocated. So here we have it! I had a database created with Oracle Database 12c that consisted of 121 32GB files for roughly 3.8TB database size yet XtremIO deduplicated the data down by a factor of 82:1! So arrays can deduplicate Oracle Database contents! Right? Well, yes, but it matters none whatsoever. Allow me to explain. Oracle datafiles consist of initialized blocks but vast portions of that initialized content is the same from file to file. This fact can be seen with simple md5sum(1) output. Consider Figure 9 where you can see the output of the md5sum command used to compute Oracle datafile checksums but only after skipping the first 8,692 blocks (8KB blocks). It’s the first approximate 68MB of each datafile that is unique when a datafile is freshly initialized. Beyond that threshold we can see (Figure 9) that the rest of the file content is identical. Thus far this blog post has proven that initialized, but empty, Oracle Database datafiles have duplicate data. As the title of this post says, however, it does not matter. Figure 10 shows the commands I used to populate each of the 121 tablespaces with a single table. The table has the sparse characteristic we are all accustomed to with SLOB. That is, I am only creating a single row in each block. Moreover, I’m populating each of these 121 tables with the same application data! This is precisely why I say deduplication of Oracle Database doesn’t matter because it only holds true until any application data is loaded into the data blocks. Figure 10 shows this set of DDL commands. After populating the blocks in each of the 121 tables (each residing in a dedicated SMALLFILE tablespace) with blocks containing just a single row of application data I took another screenshot of the XtremIO GUI Dashboard. Figure 11 shows how putting any data into the data blocks reverts the deduplication. Why? Well, remember that the block header of every block has the SCN of the last change made to the block. For this reason I can put the same application data in blocks and still have 100% unique blocks–at least at the 8KB level. Please note that the application table I used to populate the 121 tables does not consume 100% of the data blocks in each of the SMALLFILE tablespaces. There were a few blocks remaining in each tablespace and thus there remained a scant amount of deduplication as seen in Figure 11. Most XtremIO customers see some insignificant deduplication in their Oracle Database environments. Some even see significant deduplication–at least until they insert data into the database. In a follow-up post I’ll say a few words about the deduplication granularity and how it affects the ability to achieve small amounts of deduplication of unused space in initialized data blocks. However, bear in mind that the net result of any deduplication of Oracle Database data files is that the only space that can be deduplicated is space that has never had application data in it. After all, a SQL DELETE command doesn’t remove data–it only marks it as free in the block. I don’t think there are that many Oracle shops that have an urgent need for data reduction of space that’s never been used to store application data. I could be wrong. Until I find out either way, I say that yes you can see deduplication of Oracle Database datafiles but it doesn’t matter one bit. The series starts with Part I which aims to convince readers that modern systems, attached to All-Flash Array technology, can perform large amounts of low-latency physical I/O without vast numbers of host LUNs. Traditional storage environments mandate large numbers of deep I/O queues because high latency I/O requests remain “in-flight” longer. The longer an I/O request takes to complete, the longer other requests remain in the queue. This is not the case with low-latency I/O. Please consider Part I a required primer. To add more detail to what was offered in Part I, I offer Part II. Part II shares a very granular look at the effects of varying host LUN count (aggregate I/O queue depth) alongside varying Oracle Database sessions executing zero-think time transactions. Part III begins the topic of resizing ASM disks when additional ASM disk group capacity is needed. Parts I and II are prerequisite reading because one might imagine that a few really large ASM disks is not going to offer appropriate physical I/O performance. That is, if you don’t think small numbers of host LUNs can deliver the necessary I/O performance you might be less inclined to simply resize the ASM disks you have when extra space is needed. Everything we know in IT has a shelf-life. With All-Flash Array storage, like XtremIO, it is much less invasive, much faster and much simpler to increase your ASM disk group capacity by resizing the existing ASM disks. Part IV continues the ASM disk resizing topic by showing an example in a Real Application Clusters environment. Yes, Host Aggregate I/O Queue Depth is Important. But Why Overdo When Using All-Flash Array Technology? Complexity is Sometimes a Choice. This blog post is centered on All-Flash Array(AFA) technology. I mostly work with EMC XtremIO but the majority of my points will be relevant for any AFA. I’ll specifically call out an array that doesn’t fit any of the value propositions / methods I’m writing about in this post. Oracle Automatic Storage Management (ASM) is a very good volume manager and since it is purpose-built for Oracle Database it is the most popular storage presentation model DBAs use today. That is not to say alternatives such as NFS (with optional Direct NFS) and simple non-clustered file systems are obsolete. Not at all. However, this post is about adding capacity to ASM disk groups in an all-flash storage environment. Are You Adding Capacity or Adding I/O Performance? One of the historical strengths of ASM is the fact that it supports adding a disk even though the disk group is more or less striped and mirrored (in the case of normal or high redundancy). After adding a disk to an ASM disk group there is a rebalancing of existing data to spread it out over all of the disks–including the newly-added disk(s). This was never possible with a host volume manager in, for example, RAID-10. The significant positive effect of an ASM rebalance is realized, first and foremost, in a mechanical storage environment. In short, adding a disk historically meant adding more read/write heads over your data, therefore, adding capacity meant adding IOPS capability (presuming no other bottlenecks in the plumbing). If you have All-Flash Array technology it is not necessary to treat it precisely the same way you did mechanical storage. In the All-Flash Array world the object you are adding as an ASM disk is not a disk at all and it certainly has nothing like arms, heads and actuators that need to scale out in order to handle more IOPS. All-Flash Arrays allows you to create a volume of a particular size. That’s it. You don’t toil with particulars such as what the object “looks like” inside the array. When you allocate a volume from an All-Flash Array you don’t have to think about which controller within the array, which disk shelf, nor what internal RAID attributes are involved. An AFA volume is a thing of a particular size. That’s it. These words are 100% true about EMC XtremIO and, to the best of my knowledge, most competitors offerings are this was as well. The notable exception is the HP 3PAR StoreServ 7450 All-Flash Array which burdens administrators with details more suited to mechanical storage as is clearly evident in the technical white paper available on the HP website (click here). What About Aggregate Host I/O Queue Depth? So, it’s true that adding a disk to an ASM disk group in the All-Flash Array world is not a way to make better use of the array–unlike an array built on mechanical storage. What about the host-level benefit of adding a block device and therefore increasing host aggregate I/O queue depth? As it turns out, I just blogged a rather in-depth series of posts on the matter. 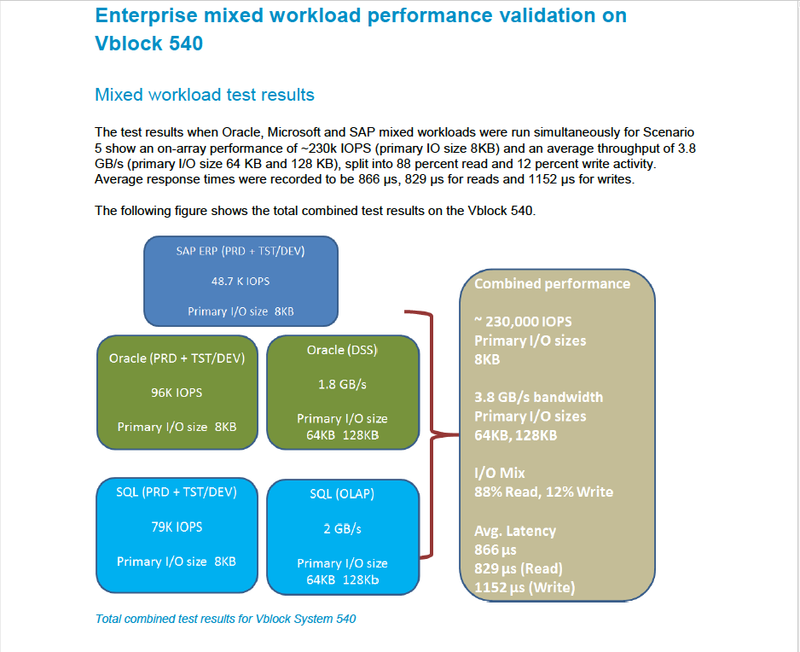 Please see the following posts where I aim to convince readers that you really do not need to assemble large numbers of block devices in order to get significant IOPS capacity on modern hosts attached to low-latency storage such as EMC XtremIO. Adding disks to ASM disk groups is not necessary to improve All Flash Array “drive” utilization. Adding disks to ASM disk groups is not necessary to improve aggregate host I/O queue depth–unless your database instance demands huge IOPS–which it most likely doesn’t. So why do so many–if not most–Oracle shops still do the old add-a-disk-when-I-need-space thing? Well, I’m inclined to say it’s because that’s how they’ve always done it. By saying that I am not denigrating anyone! After all, if that’s the way it’s always been done then there is a track record of success and in today’s chaotic IT world I have no qualms with doing some that is proven. But loading JES3 card decks into a card reader to fire off an IBM 370 job was proven and we don’t do much of that these days. If doing something simpler has no ill effect, it’s probably worth consideration. If You Need More Capacity, Um, Why Not Make Your Disk(s) Larger? I brought that up in twitter recently and was met with a surprising amount of negative feedback. I understood the face value of the objections and that’s why I’m starting this section of the post with objection-handling. The objections all seemed to have revolved about the number of “changes” involved with resizing disks in an ASM disk group when more space is needed. That is, the consensus seemed to believe that resizing, say, 4 ASM disks accounts for more “changes” than adding a single disk to 4 existing disks. Actually, adding a disk makes more changes. Please read on. Note: Please don’t forget that I’m writing about resizing disks in an All-Flash Array like EMC XtremIO or even competitive products in the same product space. Add a new 128GB disk (LUN). This involves a) creating the volume in the array and b) discovering the block device on the host and c) editing udev rules configuration files for the new device and c) adding the disk to ASM and, finally, d) performing a rebalance. Resize the existing 4 LUNs to 160GB each. This involves a) modifying 4 volumes in the array to increase their size and b) discovering the block device on the host and c) updating the run-time multipath metadata (runtime command, no config file changes) and d) executing the ASM alter diskgroup resize all command (merely updates ASM metadata). Option #1 in the list makes a change in the array (adding a volume deducts from fixed object counts) and two Operating System changes (you are creating a block device and editing udev config files and–most importantly–ASM will perform significant physical I/O to redistribute the existing data to fan it out from 4 disks to 5 disks. Option #2 in the list actually make no changes. The Resizing Approach Really Involves No Changes? How can I say resizing 4 volumes in an array constitutes no changes? OK, I admit I might be splitting hairs on this but bear with me. If you create a volume in an array you have a new object that has to be associated with the ASM disk group. This means everything from naming it to tagging it and so forth. Additionally, arrays do not have an infinite number of volumes available. Moreover, arrays like XtremIO support vast numbers of volumes and snapshots but if your ASM disk groups are comprised of large numbers of volumes it takes little time to exhaust even the huge supported limit of snapshots in a product like XtremIO. If you can take the leap of faith with me regarding the difference between creating a volume in an All-Flash Array versus increasing the size of a volume then the difference at the host and ASM level will only be icing on the cake. The host in Option #2 truly undergoes no changes. None. In the case study below you’ll see that resizing block devices on modern Linux hosts is an operation that involves no changes. None. If you add a disk to an ASM disk group you are making storage and host changes and you are disrupting operations due to the rebalancing. On the contrary the resize disks approach is clearly free of changes and is even more clearly free of disruption. Allow me to explain. The prime concern about adding disks should be the overhead of the rebalance operation. But so many DBAs say they can simply lower the rebalance power limit (throttle the rebalance to lessen its toll on other I/O activity). If administrators wish to complete the rebalance operation as quickly as possible then the task is postponed for a maintenance window. Otherwise production I/O service times can suffer due to the aggressive nature of ASM disk rebalance I/O. On the other hand, some administrators add disks during production processing and simply set the ASM rebalance POWER level to the lowest value. This introduces significant risk. If an ASM disk is added to an ASM disk group in a space-full situation the only free space for new data being inserted is in the newly added disk. The effect this has on data distribution can be significant if the rebalance operation takes significant time while new data is being inserted. In other words, with the add-disk method administrators are a) making changes in the array, making changes in the Operating System and physically rebalancing existing data and doing so in a maintenance window or with a low rebalance power limit and likely causing data placement skew. The resize-disk approach makes no changes and causes no disruption and is nearly immediate. It is a task administrators can perform outside maintenance windows. What If My Disks Cannot Be Resized Because They are Already Large? An ASM disk in 11g can be 2TB and in 12c, 4PB. Now, of course, Linux block devices cannot be 4PB but that’s what Oracle documentation says they can (obviously theoretically) be. If you have an ASM disk group where all the disks have been resized to 2TB then you have to add a disk. What’s the trade off? We’ll, as the disks were being resized over time to 2TB you made no changes in the array nor the operating system and you never once suffered a rebalance operation. Sure, eventually a disk needed to be added but that is a much less disruptive evolution for a disk group. The following section of this blog post shows a case study of what’s involved when choosing to resize disks as opposed to constantly adding disks. The case study was, of course, conducted on XtremIO so the array-level information is specific to that array. Every task necessary to resize ASM disks can be conducted without application interruption on modern Linux servers attached to XtremIO storage array. The following section shows an example of the tasks necessary to resize ASM disks in an XtremIO environment—without application interruption. 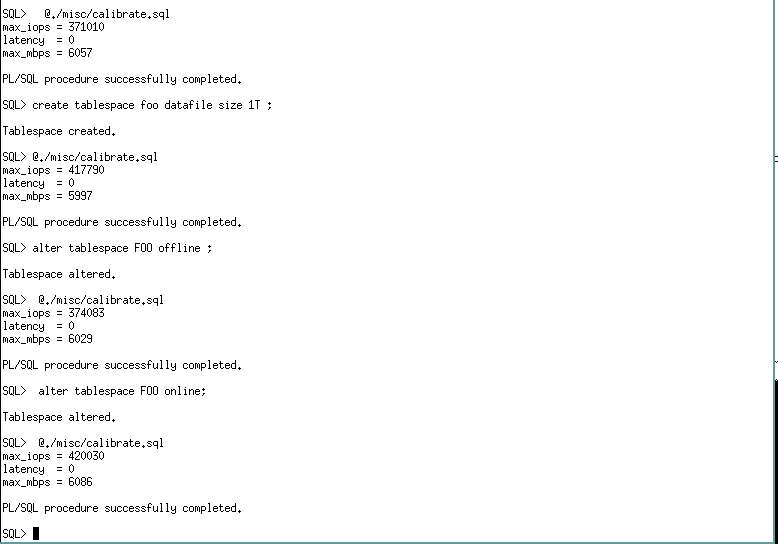 Figure 1 shows a screen shot of the ASM Configuration Assistant (ASMCA). In the example, SALESDATA is the disk group that will be resized from one terabyte to two terabytes. Figure 2 shows the XtremIO GUI with focus on the four volumes that comprise the SALESDATA disk group. 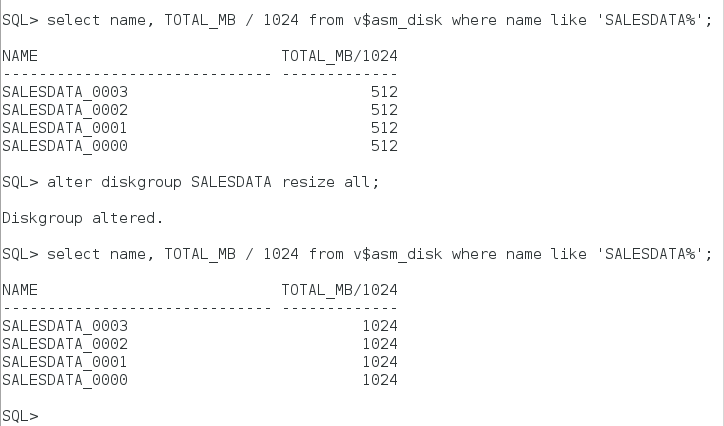 Since all of the ASM disk space for SALESDATA has been allocated to tablespaces in the database, the Space in Use column shows that the volume space is entirely consumed. Figure 3 shows the simple, non-disruptive operating system commands needed to determine the multipath device name that corresponds to each XtremIO volume. This is a simple procedure. The NAA Identifier (see Figure 2) is used to query the Device Mapper metadata. As the Figure 3 shows, each LUN is 256GB and the corresponding multipath device for each LUN is reported in the left-most column of the xargs(1) output. 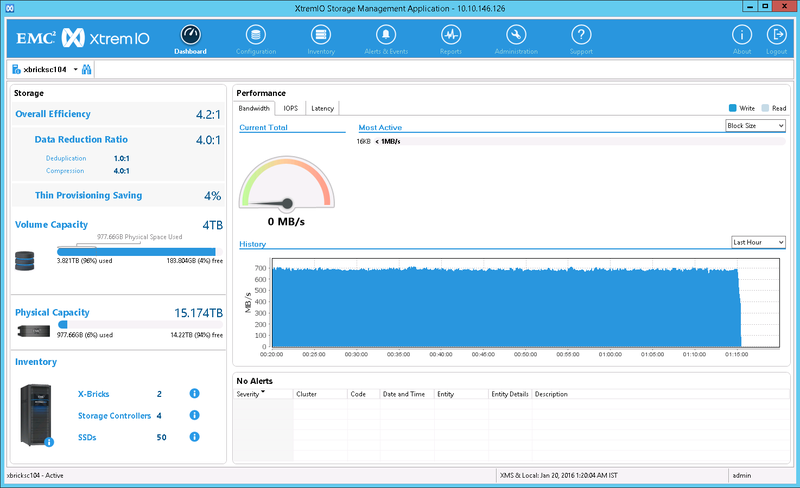 The next step in the resize procedure is to increase the size of the XtremIO volumes. Figure 4 shows the screen output just prior to resizing the fourth of four volumes from the original size of 256GB to the new size of 512GB. Once the XtremIO volume resize operations are complete (these operations are immediate with XtremIO), the next step is to rescan SCSI busses on the host for any attribute changes to the underlying LUNs. As figure 5 shows, only a matter of seconds is required to rescan for changes. This, too, is non-disruptive. Once the rescan has completed, the administrator can once again query the multipath devices to find that the LUNs are, in fact, recognized as having been resized as seen in Figure 6. The final operating system level step is to use the multipathd(8) command to resize the multipath device (see Figure 7). This is non-disruptive as well. As Figure 8 shows, the next step is to use the ALTER DISKGROUP command while attached to the ASM instance. The execution of this command is nearly immediate and, of course, non-disruptive. Most importantly, after this command completes the new capacity is available and no rebalance operation was required! Finally, as Figure 9 shows, ASM Configuration Assistant will now show the new size of the disk group. In the example, the SALESDATA disk group has been resized from 1TB to 2TB in a matter of seconds—with no application interruption and no I/O impact from a rebalance operation. If you have an All-Flash Array, like EMC XtremIO, take advantage of modern technology. Memories of constantly adding disks to ASM disk groups all over your datacenter can fade into vague memories–just like loading those JES2 decks into the card reader of your IBM 370. And, yes, I’ve written and loaded JES2 decks for an IBM 370 but I don’t feel compelled to do that sort of thing any more. Just like constantly adding disks to ASM disk groups some of the old ways are no longer the best ways. Host I/O Queue Depth with XtremIO and SLOB Session Count. A Granular Look. Part II. 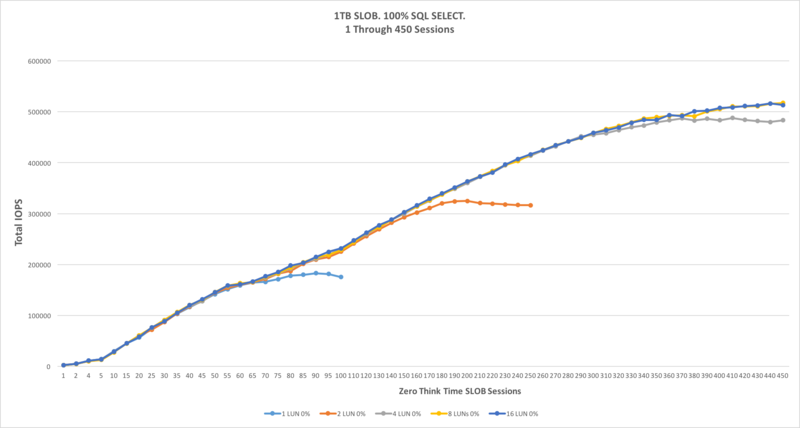 Figures 1 and 2 below show 1,2,4,8 and 16 host LUN results charted from 1 to 450 sessions for the read-only SLOB test and then 1 to 250 sessions for the 20% SQL UPDATE results. Remember that the sessions are zero think-time in this testing, therefore, IOPS are a direct reflection of latency and in this case latency is majority attributed to host queueing as I explained in the prior post. Last month I had the privilege of delivering the key note session to the quarterly gathering of Northern California Oracle User Group. My session was a set of vignettes in a theme regarding modern storage advancements. I was mistaken on how much time I had for the session so I skipped over a section about how we sometimes still expect systems performance to add up to a sum of its parts. This blog post aims to dive in to this topic. To the best of my knowledge there is no marketing literature about XtremIO Storage Array that suggests the array performance is due to the number of solid state disk (SSD) drives found in the device. Generally speaking, enterprise all-flash storage arrays are built to offer features and performance–otherwise they’d be more aptly named Just a Bunch of Flash (JBOF). The scope of this blog post is strictly targeting enterprise storage. 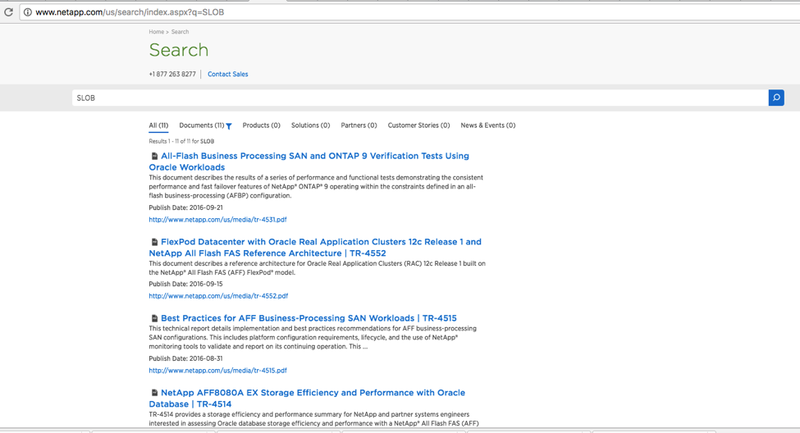 Lately I’ve seen a particular slide–bearing Oracle’s logo and copyright notice–popping up to suggest that Exadata is vastly superior to EMC and Pure Storage arrays because of Exadata’s supposed unique ability to leverage all flash bandwidth in the Exadata X6 family. You might be able to guess by now that I aim to expose how invalid this claim is. 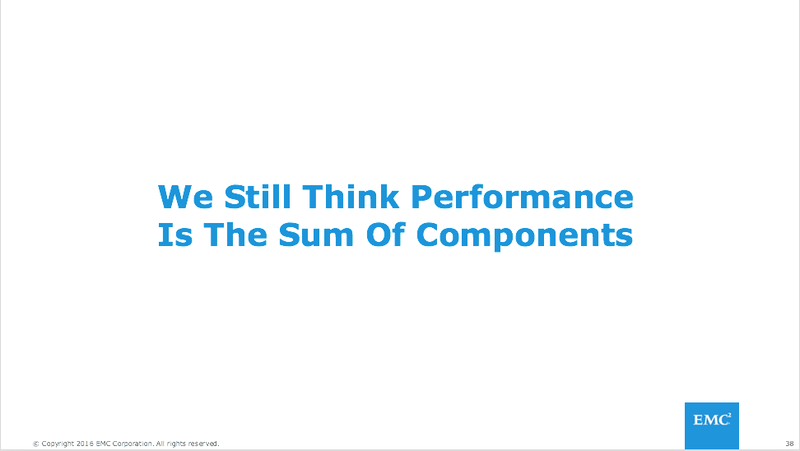 To start things off I’ll show a screenshot of the slide as I’ve seen it. Throughout the post there will be references to materials I’m citing. I’ll start by listing a few objections. My objections are always based on science and fact so objecting to content–in particular–is certainly appropriate. An XtremIO 4 X-Brick array has 100 Solid State Disks (SSD)–25 per X-Brick. I don’t know where the author got the data but it is grossly mistaken. No, a 4 X-Brick array is not limited to 60 * 100 megabytes per second (6,000MB/s). An XtremIO 4 X-Brick array is a 12GB/s array: click here. In fact, even way back in 2014 I used Oracle Database 11g Real Application Clusters to scan at 10.5GB/s with Parallel Query (click here). Remember, Parallel Query spends a non-trivial amount of IPC and work-brokering setup time at the beginning of a scan involving multiple Real Application cluster nodes. That query startup time impacts total scan elapsed time thus 10.5 GB/s reflects the average scan rate that includes this “dead air” query startup time. Everyone who uses Parallel Query Option is familiar with this overhead. Any 15K RPM SAS (12Gb) or FC hard disk drive easily delivers sequential scans throughput of more than 200 MB/s. The slide suggests XtremIO cannot scale out. XtremIO architecture is 100% scale out. One can start with a single X-Brick and add up to 7 more. In the current generation scaling out in this fashion with XtremIO adds 25 more SSDs, storage controllers (CPU) and 4 more Fibre Channel ports per X-Brick. The slide suggests “bottlenecks at server inputs” further retard throughput when using Fibre Channel. This is just silly. There are 4 x 8GFC host-side FC ports per XtremIO X-Brick. I routinely test Haswell-EP 2-socket hosts with 6 active 8GFC ports (3 cards) per host. Can a measly 2-socket hosts really drive 12 GB/s Oracle scan bandwidth? Yes! No question. In fact, challenge me on that and I’ll show AWR proof of a single 2-socket host sustaining Oracle table scan bandwidth at 18 GB/s. No, actually, I won’t make anyone go to that much trouble. Click the following link for AWR proof that a single host with 2 6-core Haswell-EP (2s12c24t) processors can sustain Oracle Database 12c scan bandwidth of 18 GB/s: click here. I don’t say it frequently enough, but it’s true; you most likely do not know how powerful modern servers are! I’m laughing, but that claim is, in fact, the perfect segue to the next section. 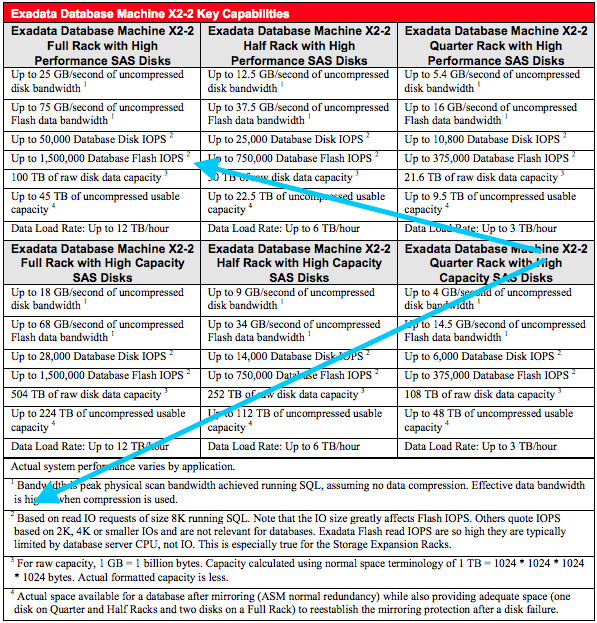 The slide accurately states that the NVMe flash card in the Exadata X6 model are rated at 5.5GB/s. This can be seen in the F320 datasheet. 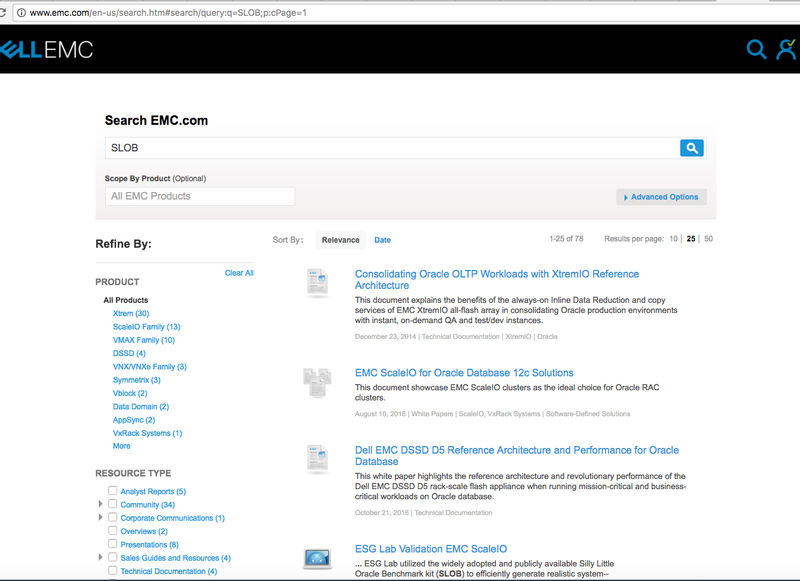 Click the following link for a screenshot of the datasheet: click here. So the question becomes, can Exadata really achieve full utilization of all of the NVMe flash cards configured in the Exadata X6? The answer no, but sort of. Please allow me to explain. The following graph depicts the reality of how close a full-rack Exadata X6 comes to realizing full flash potential. As we know a full-rack Exadata has 14 storage servers. The High Capacity (HC) model has 4 NVMe cards per storage server purposed as a flash cache. The HC model also comes with 12 7,200 RPM hard drives per storage server as per the datasheet. 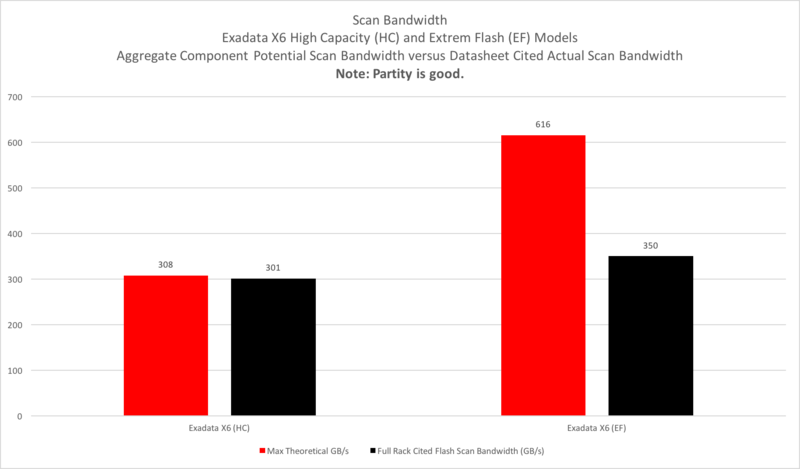 The following graph shows that yes, indeed Exadata X6 does realize full flash potential when performing a fully-offloaded scan (Smart Scan). After all, 4 * 14 * 5.5 is 308 and the datasheet cites 301 GB/s scan performance for the HC model. This is fine and dandy but it means you have to put up with 168 (12 * 14) howling 7,200 RPM hard disks if you are really intent on harnessing the magic power of full-flash potential! Why the sarcasm? It’s simple really–just take a look at the graph and notice that the all-flash EF model realizes just a slight bit more than 50% of the full flash performance potential. Indeed, the EF model has 14 * 8 * 5.5 == 616 GB/s of full potential available–but not realizable. 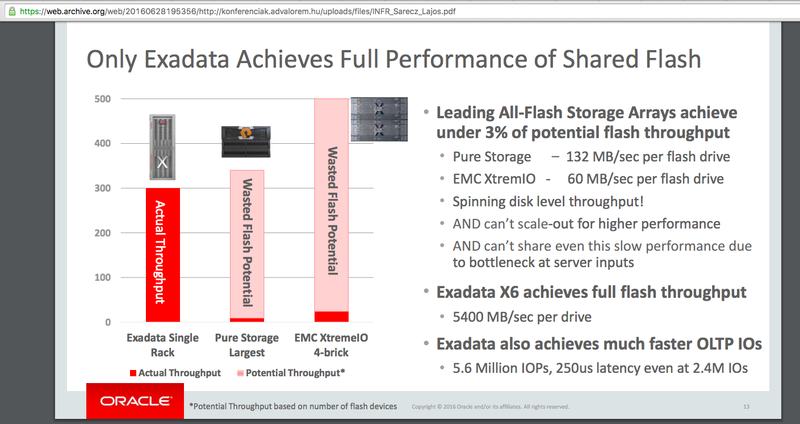 No, Exadata X6 does not–as the above slide suggests–harness the full potential of flash. Well, not unless you’re willing to put up with 168 round, brown, spinning thingies in the configuration. Ironically, it’s the HDD-Flash hybrid HC model that enjoys the “full flash potential.” I doubt the presenter points this bit out when slinging the above slide. 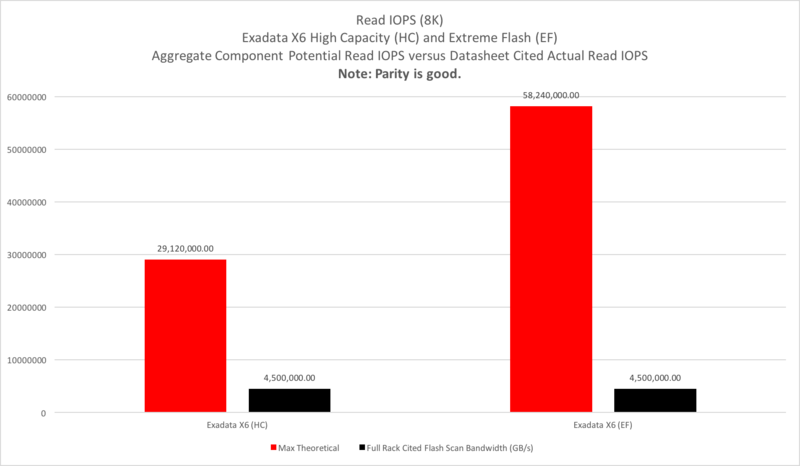 The above slide doesn’t actually suggest that Exadata X6 achieves full flash potential for IOPS, but since these people made me crack open the datasheets and use my brain for a moment or two I took it upon myself to do the calculations. The following graph shows the delta bewteen full flash IOPS potential for the full-rack HC and EF Exadata X6 models. No…it doesn’t realize full flash potential in terms of IOPS either. Here is a link to the full slide deck containing the slide I focused on in this post: http://konferenciak.advalorem.hu/uploads/files/INFR_Sarecz_Lajos.pdf. Just in case that copy of the deck disappears, I pushed a copy up the the WayBack Machine: click here. XtremIO Storage Array literature does not suggest that the performance characteristics of the array are a simple product of how many component SSDs the array is configured with. To the best of my knowledge neither does Pure Storage suggest such a thing. Oracle shouldn’t either. I made that point clear. 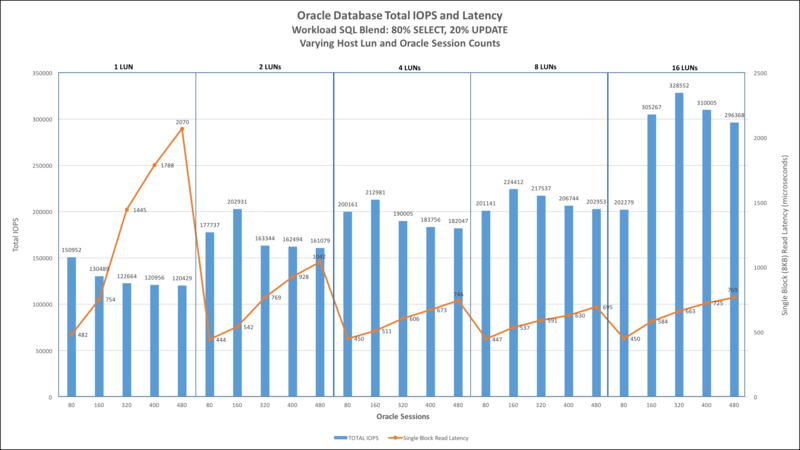 Before I share some comparisons I’d like to point out that there was a day when the Exadata data sheets made it clear that IOPS through the Oracle Database buffer cache costs CPU cycles–and, in fact, CPU is often the limiting factor. The following is a snippet from the Exadata Database Machine X2 data sheet that specifically points out that IOPS are generally limited by CPU. I know this. It is, in fact, why I invented SLOB way back in the early 2000s. 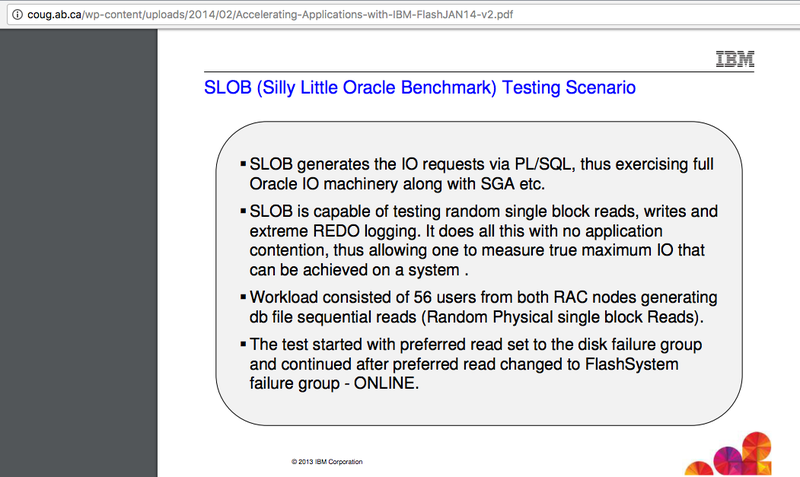 I’ve never seen an I/O testing kit that can achieve more IOPS per DB CPU than is possible with SLOB. Yes, You Must Use CALIBRATE_IO. No, You Mustn’t Use It To Test Storage Performance. I occasionally get questions from customers and colleagues about performance expectations for the Oracle Database procedure called calibrate_io on XtremIO storage. This procedure must be executed in order to update the data dictionary. I assert, however, that it shouldn’t be used to measure platform suitability for Oracle Database physical I/O. The main reason I say this is because calibrate_io is a black box, as it were. This procedure calibrates the I/O capabilities of storage. OK, I admit it. I’m being too harsh. There is also this section of the Oracle documentation that says a few more words about what this procedure does but not enough to make it useful as a platform suitability testing tool. Yes, you must run calibrate_io. The measurements gleaned by calibrate_io are used by the query processing runtime (specifically involving Auto DOP functionality). The way I think of it is similar to how I think of gathering statistics for CBO. Gathering statistics generates I/O but I don’t care about the I/O it generates. I only care that CBO might have half a chance of generating a reasonable query plan given a complex SQL statement, schema and the nature of the data contained in the tables. So yes, calibrate_io generates I/O—and this, like I/O generated when gathering statistics, is I/O I do not care about. But why? The code doesn’t even peek into the contents of the blocks being read! Having provided the above list of calibrate_io characteristics, I feel compelled to elaborate. My main issue with calibrate_io is it performs single-block random reads with asynchronous I/O calls buffered in the process heap. This type of I/O has nothing in common with the main reason random single-block I/O is performed by Oracle Database. The vast majority of single-block random I/O is known as db file sequential read—which is buffered in the SGA and is synchronous I/O. The wait event is called db file sequential read because each synchronous call to the operating system is made sequentially, one after the other by foreground processes. But there is more to SGA-buffered reads than just I/O. Wrapped up in SGA-buffered I/O is all the necessary overhead of shared-cache management. Oracle can’t just plop a block of data from disk in the SGA and expect that other processes will be able to locate it later. When a process is reading a block into the SGA buffer cache it has to navigate spinlocks for the protected cache contents metadata known as cache buffers chains. Cache buffers chains tracks what blocks are in the buffer cache by their on-disk address. Buffer caches, like that in the SGA, also need to track the age of buffers. Oracle processes can’t just use any shared buffer. Oracle maintains buffer age in metadata known as cache buffers lru—which is also spinlock-protected metadata. All of this talk about server metadata means that as the rate of SGA buffer cache block replacement increases—with newly-read blocks from storage—there is also increased pressure on these spinlocks. In other words, faster storage means more pressure on CPU. Scaling spinlocks is a huge CPU problem. It always has been—and even more so on NUMA systems. Testing I/O performance without also involving these critical CPU-intensive code paths provides false comfort when trying to determine platform suitability for Oracle Database. 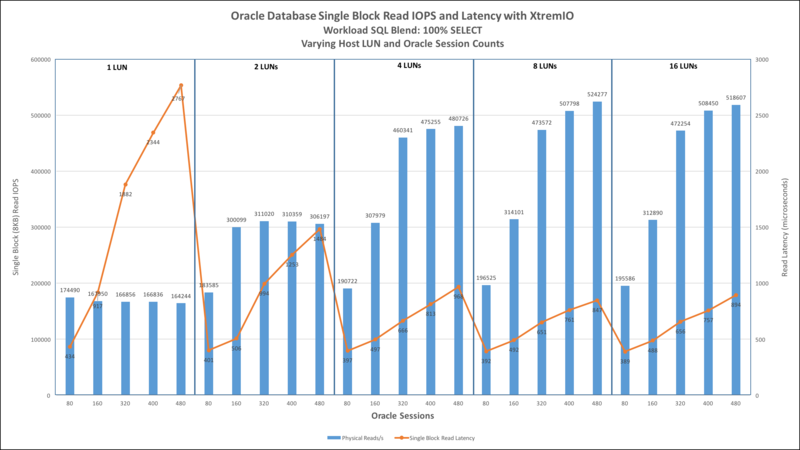 Since applications to not drive random single-block asynchronous reads in Oracle Database, why measure it? I say don’t! Yes, execute calibrate_io, for reasons related to Auto DOP functionality, but not for a relevant reading of storage subsystem performance. This is one that surprises me quite frequently. It astounds me how quick some folks are to dismiss the importance of test tools that access user data. Say what? Yes, I routinely point out that neither calibrate_io nor Orion access the data that is being read from storage. All Orion and calibrate_io do is perform the I/O and let the data in the buffer remain untouched. It always seems strange to me when folks dismiss the relevance of this fact. Is it not database technology we are talking about here? Databases store your data. When you test platform suitability for Oracle Database I hold fast that it is best to 1) use Oracle Database (thus an actual SQL-driven toolkit as opposed to an external kit like Orion or fio or vdbench or any other such tool) and 2) that the test kit access rows of data in the blocks! I’m just that way. 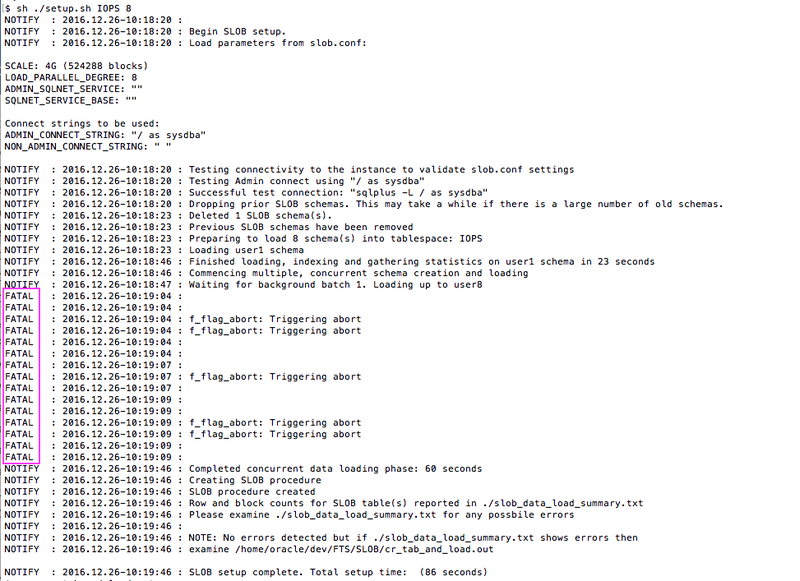 Of course SLOB (and other SQL-driven test kits such as Swingbench do indeed access rows of data). Swingbench handily tests Oracle Database transaction capabilities and SLOB uses SQL to perform maximum I/O per host CPU cycle. Different test kits for different testing. 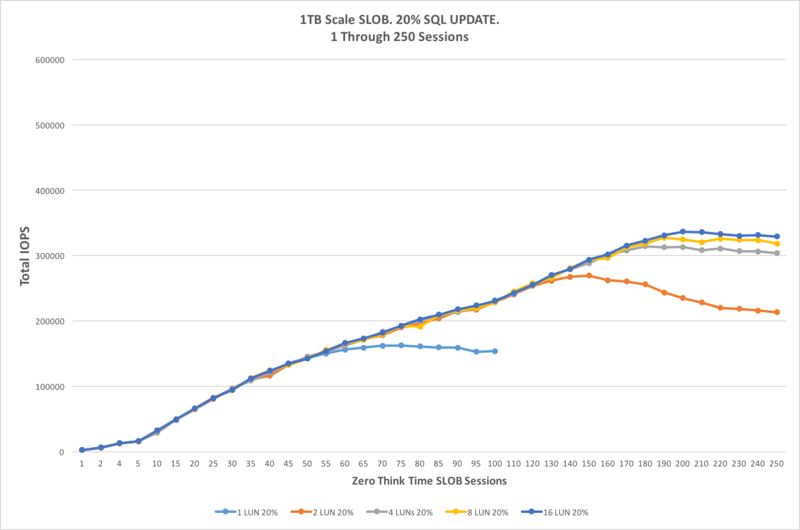 Use of the calibrate.sql script found under the misc directory in the SLOB kit (SLOB/misc/calibrate.sql) to achieve 371,010 peak IOPS and zero latency. This particular test was executed with a Linux host attached to an XtremIO array. Um, no, the actual latencies are not zero. I then created a 1TB tablespace. What is not seen in the screenshot is that all the tablespaces in this database are stored in an ASM disk group consisting of 4 XtremIO volumes. So the tablespace called FOO resides in the same ASM disk group. The ASM disk group uses external redundancy. After adding a 1TB tablespace to the database I once again executed calibrate_io and found that the IOPS increased 13% and latencies remained at zero. Um, no, the actual latencies are not zero! I then offlined the tablespace called FOO and executed calibrate_io to find that that IOPS fell back to within 1% of the first sample. Finally, I onlined the tablespace called FOO and the IOPS came back to within 1% of the original sample that included the FOO tablespace. My objections to this result is calibrate_io is a black box. I’m left with no way to understand why adding a 1TB tablespace improved IOPS. After all, the tablespace was created in the same ASM disk group consisting of block devices provisioned from an all-flash array (XtremIO). There is simply no storage-related reason for the test result to improve as it did. 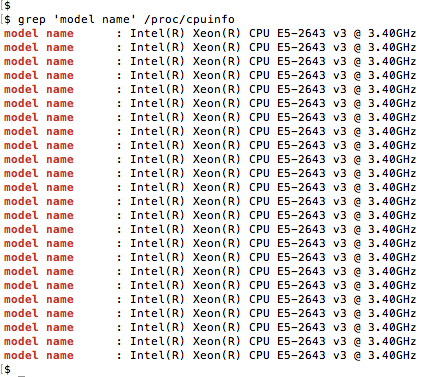 More IOPS, More Questions. I Prefer Answers. I decided to spend some time taking a closer look at calibrate_io but since I wanted more performance capability I moved my testing to an XtremIO array with 4 X-Bricks and used a 2-Socket Xeon E5-2699v3 (HSW-EP 2s36c72t) server to drive the I/O. The following screenshot shows the result of calibrate_io. This test configuration yielded 572,145 IOPS and, again, zero latency. Um, no, the real latency is not zero. The latencies are sub-millisecond though. 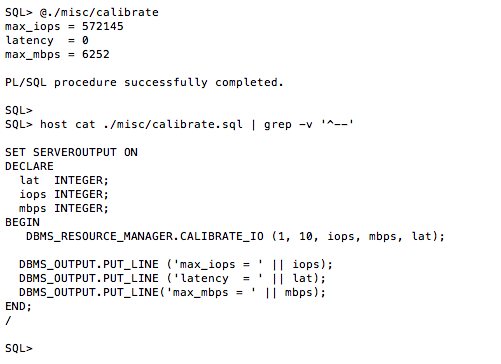 The screen shot also shows the commands in the SLOB/misc/calibrate.sql file. The first two arguments to DBMS_RESOURCE_MANAGER.CALIBRATE_IO are “in” parameters. The value seen for parameter 2 is not the default. The next section of this blog post shows a variety of testing with varying values assigned to these parameters. As per the documentation, the first parameter to calibrate_io is “approximate number of physical disks” being tested and the second parameter is “the maximum tolerable latency in milliseconds” for the single-block I/O. As the table above shows I varied the “approximate number of physical disks” from 1 to 10,000 and the “maximum tolerable latency” from 10 to 20 and then 100. For each test I measured the elapsed time. The results show us that the test requires twice the elapsed time with 1 approximate physical disk as it does for with 10,000 approximate physical disks. This is a nonsensical result but without any documentation on what calibrate_io actually does we are simply left scratching our heads. Another oddity is that with 10,000 approximate disks the throughput in megabytes per second is reduced by nearly 40% and that is without regard for the “tolerable latency” value. This is clearly a self-imposed limited within calibrate_io but why is the big question. I’ll leave you, the reader, to draw your own conclusions about the data in the table. However, I use the set of results with “tolerable latency” set to 20 as validation for one of my indictments above. I stated calibrate_io is not predictable. Simply look at the set of results in the 20 “latency” parameter case and you too will conclude calibrate_io is not predictable. So How Does CALIBRATE_IO Compare To SLOB? I get this question quite frequently. Jokingly I say it compares in much the same way a chicken compares to a snake. They both lay eggs. Well, I should say they both perform I/O. In a subsequent blog post I’ll give more details on how to configure SLOB for direct path with single-block reads! To close out this blog entry I will show a table of test results comparing some key time model data. I collected AWR reports when calibrate_io was running as well as SLOB with direct path reads and then again with the default SLOB with SGA reads. 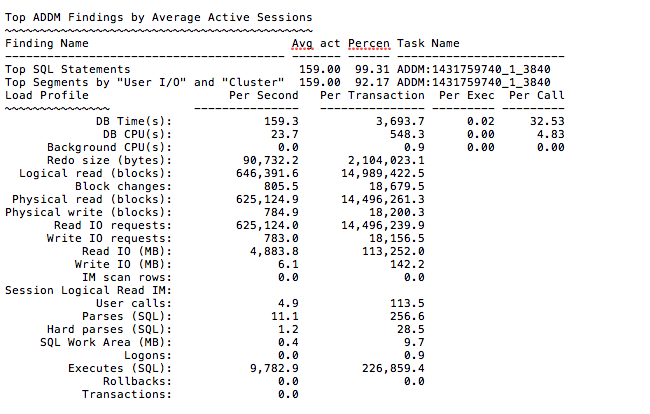 Notice how the direct path SLOB increased IOPS by 19% just because blocks flowed through the PGA as opposed to the SGA. Remember, both of the SLOB results are 100% single-block reads. The only difference is the cache management overhead is removed. This is clearly seen by the difference in DB CPU. When performing the lightweight PGA reads the host was able to drive 29,884 IOPS per DB CPU but the proper SLOB results (SGA buffered) shows the host could only drive 19,306 IOPS per DB CPU. Remember DB CPU represents processor threads utilization on a threaded-processor. These results are from a 2s36c72t (HSW-EP) so these figures could also be stated as per DB CPU or per CPU thread. 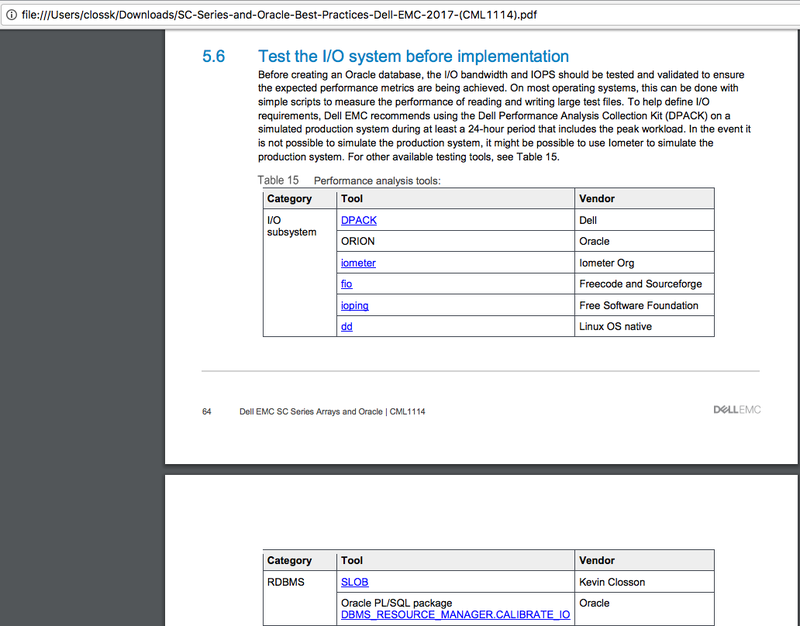 If you are testing platforms suitability for Oracle it’s best to not use a test kit that is artificially lightweight. Your OLTP/ERP application uses the SGA so test that! 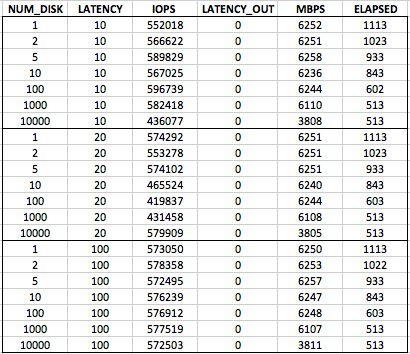 The table also shows that calibrate_io achieved the highest IOPS but I don’t care one bit about that! The Direct Path Read SLOB AWR. I recommend everything that Luca Canali writes and this deck about calibrate_io is no exception. Use calibrate_io. 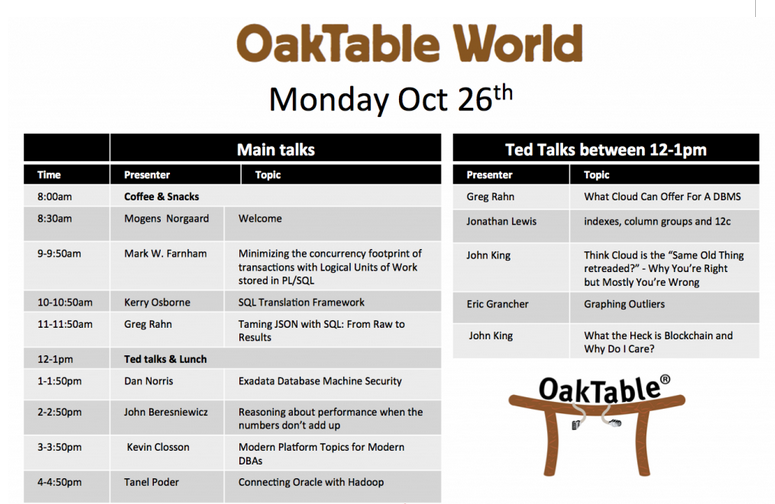 Just don’t use it to test platform suitability for Oracle Database. I don’t reblog very often–if ever. 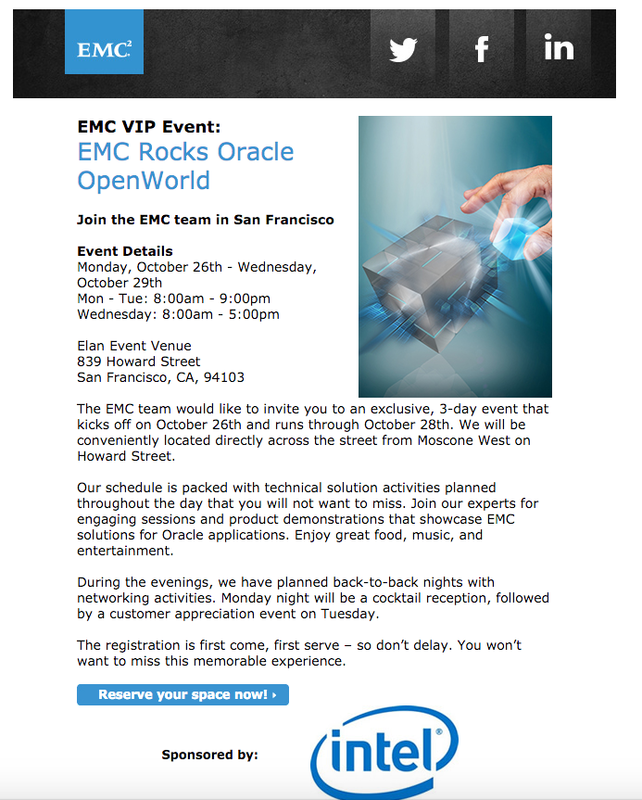 However, this blog post from EMC’s Itzik Reich is a jewel. If you are like everyone else in IT and are starting to take an interest in Docker I recommend viewing Itzik’s post! Containers are huge, that’s not a secret to anyone in the IT industry, customers are testing the waters and looking for many ways to utilize containers technologies, it is also not a secret that the leading vendor in this technology is docker. But docker itself isn’t perfect yet, while it’s as trendy as trendy can get, there are many ways around the docker runtime to provide cluster management etc’.. Wait a second, isn’t containers technologies supposed to be completely lossless, designed to fail and do not need any persistent data that will survive a failure in case a container dies?? Performance Data Visualization for SLOB. The SLOB Expert Community is Vibrant! Little Things Doth Crabby Make – Part XVIV: Enterprise Manager 12c Cloud Control 12.1.0.5 Install Problem. This is a short post to help out any possible “googlers” looking for an answer to why their 12.1.0.5 EM Cloud Control install is failing in the make phase with ins_calypso.mk. Note, this EM install was taking place on an Oracle Linux 7.1 host. Exception String: Error in invoking target 'install' of makefile '/home/oracle/app/oracle/oms12cr5/Oracle_WT/webcache/lib/ins_calypso.mk'. See '/home/oracle/oraInventory/logs/cloneActions2015-11-12_12-10-18-PM.log' for details. INFO: 11/12/15 12:10:37 PM PST: POPUP WARNING:Error in invoking target 'install' of makefile '/home/oracle/app/oracle/oms12cr5/Oracle_WT/webcache/lib/ins_calypso.mk'. See '/home/oracle/oraInventory/logs/cloneActions2015-11-12_12-10-18-PM.log' for details. Click "Retry" to try again. Click "Ignore" to ignore this error and go on. Click "Cancel" to stop this installation. So if this error hath made at least one googler less crabby I’ll consider this installment in the Little Things Doth Crabby Make series all worth it.